The lowdown: Regarded as the most wine-like style of beer, this approachable Belgian is a great entryway into the world of sour beers. 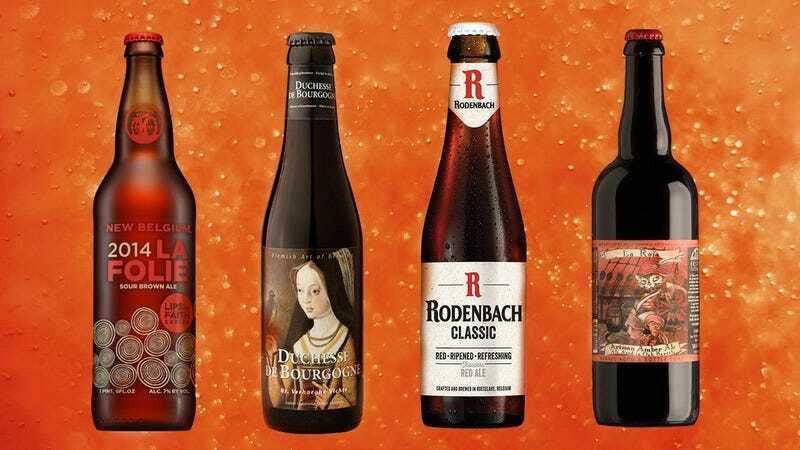 The trailblazing beer writer (not the king of pop) Michael Jackson called Rodenbach Grand Cru the “Burgundy of Belgium.” I’m not usually one to argue with dead giants of the field, but I find Flemish sours to be far more interesting than wine. Flanders red and Rodenbach are essentially synonyms at this point, though when the Roeselare, Belgium brewery started back in 1821 its distinctive brewing system was not rare (in fact, it’s likely the brewers were inspired by how their English counterparts made porter). It’s a method still employed today: brewing a beer (made red by a specialty malt) the same way you would any ale, then maturing that beer in huge oak tuns (often called foeders, of which Rodenbach has nearly 300), where fermentation continues at the hand of microflora living in the wood (usually lactobacillus, the same organism that makes yogurt tangy). Once the wood has worked its magic on the beer (a process that can take up to two years at Rodenbach), fresh “young” beer is usually blended in to achieve the desired level of pucker. While Rodenbach and nearby Verhaeghe (brewer of Duchesse De Bourgogne) and Omer Vander Ghinste (brewer of Cuvée Des Jacobins) breweries produce enough Flanders red to make it easy to procure in most major American cities, they are some of the only traditional makers of the style left in Belgium. With the space and time requirements of the style, it’s not the first choice for American craft brewers looking to experiment. All that is to say, it would only take a few unfortunate events to decimate the world supply of Flanders red. So drink ’em if you’ve got ’em (or let them age in your cellar, as the taste continues to develop over time in unpasteurized versions of the style). The taste: Within the category of Flanders red lies a spectrum of sourness. If you’ve tried a Flanders red and found it too acidic, chances are you could find a milder version that would better suit your palate. These beers—no joke—can taste like Sour Patch Kids. After an initial pucker, fruit flavors come out as the drink’s effervescence spreads across the tongue. Departing from the sour candy profile, a background of malty flavors develops that ground the taste as distinctly beer-derived—though the clean, dry aftertaste and occasional tannins evoke wine. When I interviewed Rodenbach head brewer Rudi Ghequire in 2015 he made a point to connect the beer to food, so for a complete taste pair your Flanders red with a good meal (beer writer Michael Jackson would recommend the Flemish beef stew carbonade flamande). Possible gateway: Rodenbach is the longest running and biggest producer of Flanders red beers. Using many of the same oak foeders since the 1800s, it’s an understatement to say its flavors are “dialed in.” Rodenbach Classic is a very easy drinking beverage with three-parts young beer added to one-part aged beer, thus cutting the sour aspects of the drink substantially. If you get its Grand Cru, you’ll have a much better sense of what that aging process can do since the blend is two-to-one aged-to-young beer. The other Flanders red that tops beer rankings is Duchesse De Bourgogne by Verhaeghe Brewery. This blend of 18-month-old and 8-month-old beer produces a coveted blend richer than Rodenbach Grand Cru. If you’re the type who cares about brewery ownership, Verhaeghe is an independent brewery while Rodenbach is owned by Palm Brewery, a company with roots in the early 17th century. Palm was recently acquired by Bavaria N.V., a Dutch brewing company with roots in the early 18th century. Verhaeghe by comparison, is just a whippersnapper, going into business in 1885. Other good American-made options include Jolly Pumpkin’s La Roja, a beer that President Barack Obama probably came this close to drinking when he visited the Detroit brewpub in 2016 (photos show him with an iced drink, so he probably didn’t order a beer). Jolly Pumpkin was one of the first breweries focused primarily on sour beer in the American craft brewing revolution when it opened in 2004. The brewer now operates three brewpubs and a taproom in Michigan. Bloomington, Illinois’ Destihl Brewery also bet on sour beer before it was clear they were a good investment in the American market. Its Wild Sour Series features a Flanders red that falls on the heavily acidic end of the spectrum. Expect Destihl beers to become even easier to find this summer as it opens a new $14 million facility and expand its production capacity.